I dumped my brown, red and blue scrap buckets and I'm going to make a huge scrappy log cabin quilt top. I have a flannel sock monkey backing. It's only going to be about 55"x 55" but it will make the perfect baby quilt. I'll keep ya posted. Happy to have these two keeping me company today. 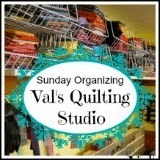 Tomorrow is:Sunday Organizing and I'll be highlighting Thread Storage! Ooooooh, I'm envious of all that cutting / sewing space! Sounds (and looks) like a great day to me! It's sewing weather here too with storms blowing through... we need the rain so hoping for more. Hi Val, I love your large studio space. I noticed you have an interest in stained glass. I have just started making fused glass pendants and buttons. It goes so well with sewing. I share the space with my husband and he is actually the one who does the stained glass. Although I have made a fused dish in a class with him...and that was fun! I, too, love your sewing space! The scrappy log cabin in blue and red sounds wonderful. Your sewing space is just fantastic.Love it! I love that I can just shut the door and leave my WIP with no worries. I've been "scrap" sewing all weekend and can't wait to share the results! Looks like such a productive space!! I can't imagine having such a nice place to sew. Two little dogs are awfully cute. How do you even get anything done with them around? that is a really lovely space.....lots of table top areas! but still seems spacious!